Please note two of the ladies heads came off due to damage in transit. We have repaired the figurine and still looks great, but unfortunately small chip damage is visible on close inspection of the ladies necks. The daughters of Zeus. The Three Graces. Beautiful decorative ladies plate. 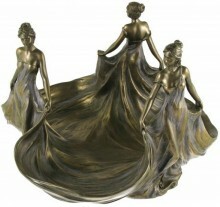 Very nice quality cold cast bronze figurine plate. Arrives in a blue decorative box and polystrene protective casing. A Veronese design. 23 cm (9 inches).